I watched Paper Towns yesterday. Having read the novel and enjoying it, I had my expectations exceeded. Though I did not love it, I thoroughly enjoyed it. Albeit for different reasons than most. Paper Towns is not a cinematic masterpiece. More often than not, it's slow and pretentious. Like every John Green novel ever. It still captures the heart and soul that makes them so popular. Like every John Green novel ever. Paper Towns is not the next Fault In Our Stars. It doesn't try to be. What Paper Towns is, is a fine, better-than-average, coming-of-age comedy. It also deconstructs the Manic Pixie Dream Girl archetype and explores themes of idealization and identity. Paper Towns is not a romance, even if it has romantic elements. Paper Towns is about Quentin Jacobsen (Nat Wolff), his friends, and his obsession with Margo Roth Spiegelman (Cara Delevigne). One night, she brings him along a whirlwind adventure then she disappears. The question remains. Who is the real Margo? At first, Margo is a classic Manic Pixie Dream Girl, whose sole purpose is to make Q realize the importance of living in life. She's mysterious, cool, a myth. The myth of Margo Roth Spiegelman. However, as the story progresses, it becomes obvious Margo did not want to be the myth. Man maketh myth. She just lived her life. She becomes a deconstruction of the MPDG character from male-oriented romances. Q adored her, admired her, and placed his ideals into her. His life eventually began to revolve her, but it was by his own doing. She did nothing else. Q believed he cracked the Margo. Who wants him to find her. Who sets the whole plot. Who creates this adventure for him. Just so he could live. In short, Q believes in what he wants Margo to be. He sees who he wanted to see in Margo. He views her as a mirror than a window. 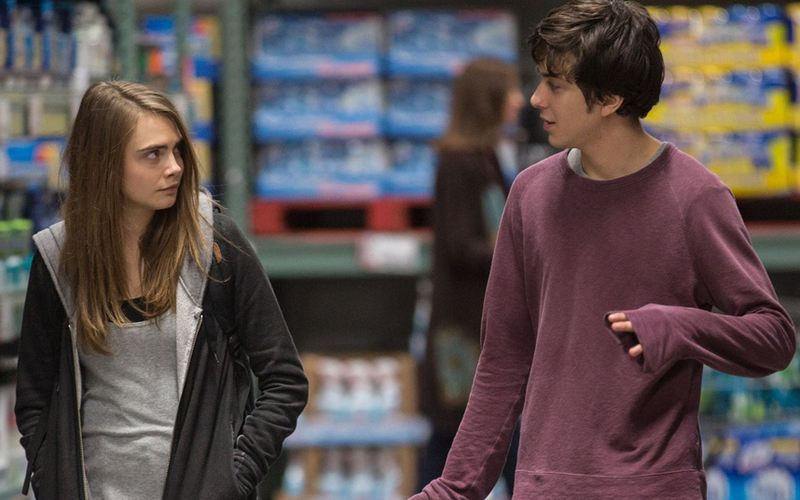 Themes presented in Paper Towns are what makes the film and book so well-liked. Identity, and adoration among others. Q was never in love with Margo, he was in love with the idea of her. The enigmatic and challenging Margo. He forgets what we all do sometimes. We forget that Margo, above all, is a person. That's the thing about people. We are not mysteries to be solved, puzzles to be cracked, or prizes to be won. We are humans with flaws and faults that needed to be discovered. The moral of Paper Towns is important in the era of romance and fantasy..
People can't be idealized. We shouldn't be. We are an amalgamation of flesh, bone and thoughts we can't process. Each unique individual free from cryptic mysteries or clear knowledge. We are people, imaginable and consistently misimagined. Quoted from John Green. Paper Towns is not a film or book to be remembered for its style or writing. I don't even know if I will remember it in a month's time. Yet, Paper Towns remains a film to be watched and a book to be read. It's examination of teenage glorification is one we could all enjoy and learn from. Okay I lied. This isn't a review per say. More like an English student's analysis on themes presented. Yes. I used my English Literature analysis skills on Paper Towns instead of Othello. My apologies to disappointed teachers. So have you read/watched Paper Towns? What do you think about it? I haven't watched or read Paper Towns, and I still haven't read The Fault in Our Stars! I'd certainly like to give it a read - or a watch! - at some point, but I've got a list of other books I'd like to read first. I really enjoyed reading this post though - you've made it sound very interesting, especially the themes and character development! I'm glad to hear you enjoyed it, I want to see the movie over the weekend! I still need to read the book, which is on my shelf waiting for me to read it, so I still haven't watch the film yet, I can't wait. I only read the beginning of your post, to avoid spoilers, but I'm keen to watch and perhaps read it. I like John Green, he's cool. I haven't read or watched the movie, but I did see the trailer. I read the book, and I don't like it at much as as the other books written by John Green. That's also the reason why I'm not too excited to see the movie. I really wanna read the book and watch the movie. Cara Delevigne has been blowing up so I kinda wanna see if she can act! Can't wait to watch this! How was Delevinge's acting in your opinion? I've not read or watched paper Town but I have seen the reviews for it. I'll probably have to gag and chain my husband to drag him for the show though....if there's no explosion or Marvel in a movie, he's not interested. LOL! I read the book and I loved it, its the avant premiere next Tuesday here in Belgium and I get to go so I'm very excited although I try not to have the highest of expectations. Even though TFIOS broke me down emotionally I think I liked the Paper Towns story better, maybe an unpopular opinion but I like the who idea behind it. I like how she's pretty but not "typically" pretty, I like how she sort of knows what she wants but also not really. The trailer of the movie looks great and I'm just really excited about it. Great review though, enjoyed it! Great review (err...analysis)! I tried reading 'The Fault in Our Stars', but absolutely could not get into it. It could have been because of my English Literature background (I received my BA in English). While I should just finish it up like a good reader, I just cannot get into the writing. I haven't read the book or watched the movie, though I probably will once it's out on Netflix and whatnot. I have to say, I feel like many of John Green's novels are so exalted on Tumblr and other websites - I remember before TFIOS came out, I literally scrolled past thousands of "Maybe OK will be our always" quotes on my dashboard. It was worse than all the Blank Space quotes a while ago. I definitely have seen the idealization of other people in my day to day life. Sometimes I don't even realize it! I think this idea is touched on in Gone Girl as well, when Amy Dunn describes what a "cool girl" is. Definitely worth a read if you haven't already! To be honest, I didn't read this post because I'm planning to watch the movie and I haven't read the book yet. I didn't want to spoil it. I LOVE paper towns! or simply put, everything created by John Green. Can't wait for the movie, love your review! I'm a sucker for YA, or at least I used to be. Paper Towns is among my top 5 favourite YA novels. I like John Green. His writing is amusing IMO. However, I'm not interested in watching the movie adaptations of his works so far. I haven't watched The Faults in Our Stars and I don't think I ever will. When I first heard about Paper Towns getting a movie adaptation, I was intrigued. But after getting (what felt like) tons and tons of promotions from John Green's Tumblr, I got sick of it. And now I'm not interested at all. Thank you for reviewing the movie, I haven't read the book or watched the movie, so I skipped the spoilers, but I really like your conclusion: we human beings are not a mistery to be solved, but just humans to be loved and accepted. That just motivated me to read the book. I was a bit late to John Green. I remember my friends got excited and pre-ordered TFIOS, and then on the day it came out I wanted to know what the fuss was so I downloaded the e-book. Which I then read straight through and loved. I would easily list TFIOS as one of my favourite books. I just really really liked it. Then I continued reading his books and I LIKED them but you can see why TFIOS is THE ONE compared to the others. I feel like I mainly want to see this film because of Cara, and Margo isn't even IN the story that much so... Idk. I'm going to say that I will probably watch it once it's available online somewhere. But it also doesn't come out in the UK until the end of August, so who knows, maybe I'll have a lazy cinema day and decide to see it after all. I never like reading a book and having it made into a movie! A few exceptions are Lord of the Rings and Pride and Prejudice! I have to admit I don't think I will ever read this book or see this movie! I sadly don't do a lot of reading - but I probably will watch the film version of this because of Cara, hahaha. I haven't read any John Green books actually - I dunno, everyone seems to love them but they don't really give off any vibes to me. I'm more into Harry Potter and other action/fantasy books more than anything, I think. I don't have the time to watch it but i'm eager to. Sounds great for teenagers LOL. I loved this book so was intrigued by your analysis! It is not a romance but kind of a romantic view of her character. I like your point that people can't be idealized, he idealized her and learned she was just human. Looking forward to the movie! 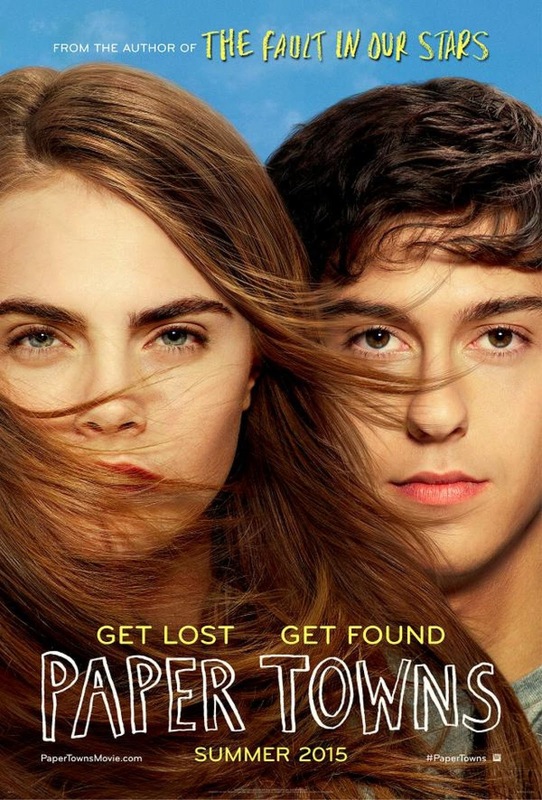 As for Paper Towns, I did read did but I do not intend to watch the movie (unless if it's on Netflix). Paper Towns was my first Jonh Green book and most definetly my last. I got interested into John Green because of the hype over The Fault In Our Strars (which I did not read nor watch simply because I hate books/movies talking about death/deseases/etc. )Personally, I think that John Green is overrated. There wasn't much in the book that made me want to know what was going to happen. I really forced myself to finish it and was extremely glad when I finally did. So, I did not enjoy the book at all.